The cold and rain of November got you down? How about a trip to the sultry bayous of Louisiana and a love story that will keep you warm? Bayou My Love, a tale of romance, secrets and suspense, by award-winning author Lauren Faulkenberry is on sale today through November 26th for $0.99 on online retailers. Sale applies in the U.K. too! 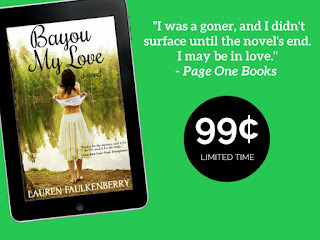 Find Bayou My Love on Amazon!